Indianapolis, Indiana, November 10, 2008 -- The Star Alumni Association of Indianapolis, Indiana is excited to announce that a Star Alumni Corps will be performing at the Drum Corps International World Championships at Lucas Oil Stadium in August 2010. 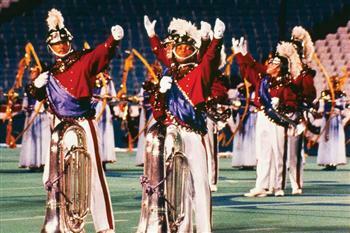 Star of Indiana formed in 1984 and fielded a competitive junior drum and bugle corps between 1985 and 1993. Alumni of Star of Indiana, Brass Theater, Blast!, Shockwave, Cyberjam, Mix, and Star United are encouraged to participate in the Star Alumni Corps. The Star Alumni Corps will perform a field show that embodies the essence of the Star of Indiana Drum and Bugle Corps that was based in Bloomington, Indiana. 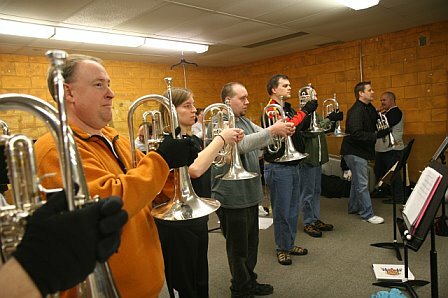 Part of the mellophone section at an April 2009 rehearsal of the Star Alumni Corps in Bloomington, Indiana. The exhibition performance will be a comprehensive representation of all of the years of the corps’ competitive existence, 1985 through 1993. The performance will be at a level of excellence on par with the original corps. We aim to impress the audience and fans with a repertoire of the signature drill moves and music for which the corps became famous. Rehearsals are anticipated to begin in the second quarter of 2009. Star Alumni gathered most recently in May 2004 to perform at the Indianapolis 500 Parade. Plans are underway to include the corps in the 2010 Indy 500 Parade. The Star Alumni Association invites alumni to reconnect with the organization. For more information on the Star Alumni Association and the 2010 event, please visit www.staralumni.org and for details or membership in the Star Alumni Corps, visit www.staralumni.org/starofindiana2010. You may also contact office@staralumni.org or Star Alumni Association, PO Box 1981, Indianapolis IN 46206.